LaVeda Blanche Wilson, 79, of Lamar, Mo., passed away March 22, 2019, at Freeman Hospital in Joplin, Mo. LaVeda was born May 19, 1939, in Shickley, Neb., to Henry John Wessler and Laura Rosine Remona (Holtzen) Wessler. LaVeda graduated from Lamar High School in the class of 1957. On Aug. 8, 1958, LaVeda married Fred Willis Wilson in Lamar, Mo. LaVeda was a homemaker who enjoyed quilting and knitting along with tending to her flower garden and hosting family gatherings, but the true joy in her life were her two grandchildren. 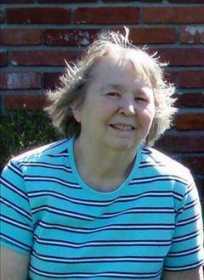 LaVeda was also an active member of Grace Lutheran Church for over 60 years. LaVeda is survived by two sons, Donald (Joann) Wilson, Lamar, Mo., and Kenneth Wilson, Nevada, Mo. ; along with a daughter, Jeannette (Dana) Eaves, Jefferson City, Mo. ; one sister, Bonnie Wessler, St. Peters, Mo. ; two grandchildren, Hannah Eaves, Springfield, Mo., and Samuel Wilson, Lamar, Mo. ; and one sister-in-law, Betty Wessler, Springfield, Mo. Preceding her in death were her husband, Willis Wilson; a son, Ronald Wilson; four brothers, Wilbur Wessler, Charles Wessler, Merlyn Wessler and Lee Wessler; and one sister, Ramona Wessler. Lee passed on March 16, 2019. Funeral services were 11 a.m., Saturday, March 30, at Grace Lutheran Church, with burial at Lake Cemetery. The family received friends from 6 to 7 p.m., Friday, at the funeral home. Contributions are suggested to American Cancer Society or American Heart Association in care of Daniel Funeral Home.